Cayenne Peppers - EDCO Food Products, Inc. The Cayenne (chile) pepper is a member of the Capsicum family of vegetables. The common name "Cayenne" was actually given to this pepper because of its cultivation in a town that bears the same name in French Guiana on the northeast coast of South America. 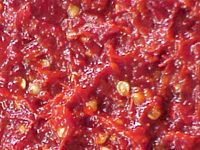 The Cayenne pepper for making mash or hot sauce averages 2,500 Scoville Heat Index and is popular with those looking to add heat to food.